Lusty Lemon Crush Olive Oil - Calivirgin Lusty Lemon olive oil is made by crushing real fresh lemons together with the olives. The result is a fresh, unfiltered, premium olive oil with no additives or preservatives, resulting in a natural lemon flavor. Try this California olive oil on seafood, chicken or fresh steamed vegetables for a mouthwatering taste. Also perfect for salads, pasta and bread dipping. Bountiful Basil Crush Olive Oil – Calivirgin Bountiful Basil olive oil is made by crushing fresh basil together with the olives, resulting in a fresh, unfiltered, premium olive oil with no additives or preservatives that has a natural basil flavor. 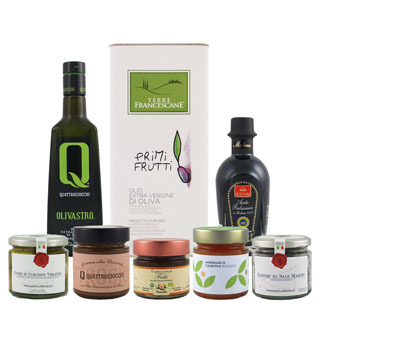 Try this California olive oil on tomatoes and fresh mozzarella with Calivinegar Barrel-Aged Balsamic for a great caprese salad or on pasta or baked potatoes with fresh grated Parmesan. Calivirgin Premium Extra Virgin Olive Oil - This unique unfiltered blend of estate grown Arbequina and Koroneiki olives is cold-extracted within hours of harvest, which produces a fresh, aromatic, fruity flavor that is perfect for dipping but mild enough to use as a culinary staple in your kitchen. This oil is certified for exceptional quality by the California Olive Oil Council and is a recent Gold Award winner at the International New York Olive Oil Competition. Calivinegar Barrel Aged Balsamic – Calivinegar Barrel Aged Balsamic Vinegar is a rich and delicious aged balsamic from Modena, Italy with a perfect balance between acidity and sweetness with a thick, velvety texture. Guilty Garlic Crush Olive Oil - Calivirgin Guilty Garlic olive oil is made by crushing fresh garlic cloves together with the olives. The result is a fresh, unfiltered, premium olive oil with no additives or preservatives, resulting in a truly natural garlic flavor. That garlic press may collect dust in your drawer after you discover how easily this California olive oil adds flavor to your cooking.